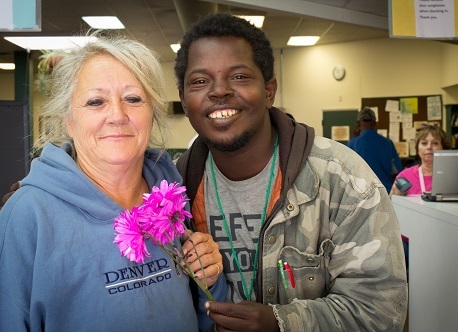 Your financial gift, regardless of the amount, will enable St. Francis Center to continue to provide vital resources to those in our community who are homeless, leading to personal transformation and ultimately to self-sufficiency. All gifts to SFC are tax-deductible to the extent provided by law. Ninety-one percent of every dollar donated is spent directly on programs and services, so your financial contribution goes a long way toward allowing SFC to continue providing vital resources to our guests. Learn more about what your financial contribution can provide by clicking here. Many companies match their employees’ donations dollar-for-dollar. Make your donation to SFC go further by checking with your human resources department to see if your company will match your donation. If they will, please be sure to let both us and them know about your donation to St. Francis Center. Make a financial donation to St. Francis Center in memory of a loved one, as a thank you to someone, or in commemoration of a special occasion such as a birthday, anniversary, or graduation. When making a memorial or tribute gift, please provide their information when making your donation online, and we will be happy to send a note acknowledging your gift. St. Francis Center is a Denver Enterprise Zone designee. Cash contributions from $200-$100,000 per year are eligible to receive a 25% Colorado income tax credit, in addition to the normal federal and state charitable contribution benefits. In-kind contributions valued at $250 and more receive a 12.5% credit. Both individuals and businesses are eligible for DEZ credit. The credit cannot exceed Colorado tax liability; however, excess credit may carry over for up to five years. We are required by the Colorado Department of Revenue to submit your paperwork with the last four digits of your Social Security Number or State or Federal Tax Payer Identification Number. If we don’t already have your number on file, please provide it with your donation.